In April 2017, the United Kingdom (UK) Government introduced new gender pay gap (GPG) transparency regulations under the Equality Act 2010 to encourage large employers to identify and address any gender pay gap. ServiceSource International, Inc. (NASDAQ: SREV) brings the world’s greatest brands closer to their customers through digitally-enabled solutions and data driven insights that personalize and power the moments that matter. Backed by 20 years of experience, an industry-leading technology platform, a robust global footprint, and a powerful suite of solutions that enhance every touchpoint along the Customer Journey Experience, we deliver impactful revenue growth for global market leaders. Operating out of eight countries with more than 3,000 sales delivery professionals speaking 45 languages, ServiceSource drives billions of dollars in client value annually. Our UK office is located in Liverpool, and our global headquarters is in Denver, Colorado, USA. As of April 5, 2018 (the Snapshot Date), ServiceSource employed 237 eligible individuals in the UK; 50% of whom were women and 50% of whom were men. Our gender pay gap for ordinary pay increased slightly from the 2017 snapshot date to the 2018 snapshot date (2% for the mean, and 2% for the median). However, we made positive progress during that time period by increasing the proportion of females in the upper middle and upper pay quartiles (from 42% in upper middle, and 28% in upper, to 49%, and 35%, respectively). It is difficult to pinpoint the exact initiative that we launched that may be driving this change of the many that we implemented last year in response to the GPG disclosure. However, we believe our most successful initiative has been the launch and support of a women’s career support network and group, which is sponsored by management, run by employees, and meets bi-monthly to discuss career development and other topics of interest to our female colleagues of all levels. Gender parity is a priority for ServiceSource. We are committed to fostering an inclusive workplace where all employees are able to achieve their full potential and have the same opportunities for recognition, reward, and career development. Promotion of our flexible working policies. “At ServiceSource, we maintain our commitment to equal treatment of all of our colleagues, across all levels, ensuring that all Sourcers have the same opportunities, recognition, and career development regardless of gender. Our commitment to equal treatment is reflected in our voluntary reporting of our gender pay gap this year. Although we are below the threshold for required reporting, we believe that transparency in reporting on our gender pay gap will lead to more accountability and progress in our business. We encourage other businesses to also voluntarily report their gender pay gap information. What is measured, is managed. As of the April 4, 2018 measurement date, we continue to have a significant gender pay gap, which has risen slightly from our reporting last year. 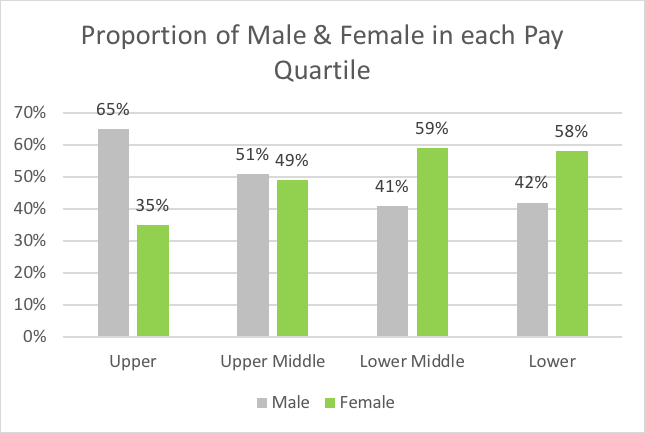 We have, however, seen a positive change in the proportion of females in the upper two quartiles (upper middle and upper) since our reporting last year. We believe the main reasons for our gender pay gap in our UK business are fewer women in senior leadership positions, and fewer women working in our field sales–related roles such as outside sales and solution design that generally provide higher pay and bonuses. For example, if we exclude field-sales related roles from our April 4, 2018 gender pay gap analysis, we see an improvement of 6%. As such, our initiatives for 2019 are focused on encouraging career development of our female employees. We have seen many positive changes during the 2018 fiscal year which will not be reflected in the reported results, which are as of April 4, 2018. Importantly, we have seen a 25% increase in women successfully joining or being promoted into managerial roles within our UK business. With more women in leadership roles, we are confident that our gender parity will continue to improve as more junior women Sourcers recognize the leadership opportunities available to them. We continue to have a long term commitment to gender parity globally. We recognise that we still have a long way to go, and we plan to continue to drive towards parity through sponsorship and promotion of various initiatives designed to increase our gender diversity at all levels.